One Belt, One Road and many hopes for China’s regions and cities. The island is no longer an island, but the city on it is not yet a city. A calming yet strange silence envelops the enormous government-built conference center. As I walk past another large building, the spacious civic center, a flock of birds swirls just in front of me before rushing to safer heights. The birds are the only beings I encountered on the footpath. Some doors in the shopping alley already have names on them but the windows reveal their emptiness. It is Monday, there is no holiday, and it is still before the end of the working day; yet I noticed only a few people. Is it a ghost town? No, for ghosts are the emanations of the deceased and this city is just waiting to be born. There is no sense of decay, but of hope. 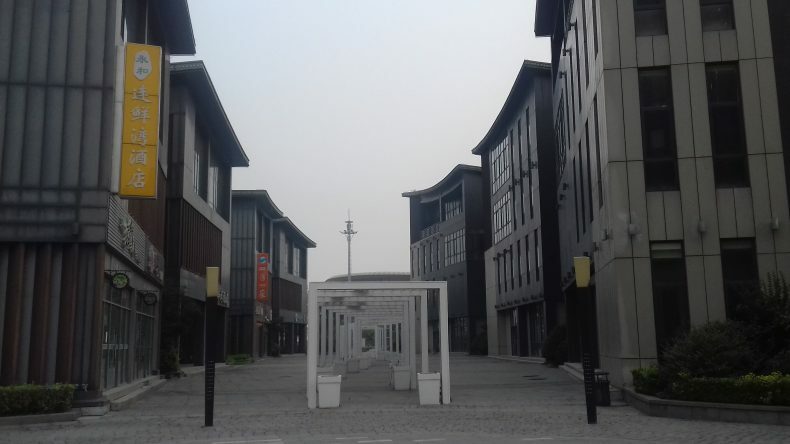 The “Lianyun New City” – which is in fact the new business district of a city called Lianyungang – is waiting by the sea, hoping to be engulfed by the flood of development. Lianyungang was recently mentioned by China’s leader, Xi Jinping, as one of the nodal points of the Belt and Road Initiative (previously known as One Belt, One Road, hence OBOR/BRI). The expression was timely as it appeared in Xi’s speech during the Belt and Road Initiative Forum held in Beijing in May 2017. Even before the OBOR initiative was first announced in 2013, Lianyungang was being mentioned as the starting point of OBOR’s earlier and smaller avatar, the Eurasian Land Bridge. Lianyungang could indeed be a symbol of the Belt and Road rhetoric as it is conveniently located at a cross-section of land and sea routes. The railway line is a part of a network that not only reaches western China but stretches on through Kazakhstan to Europe. At the same time the coastal city is located not far away from the bustling South Korean port of Busan. Thanks to an agreement signed in 2013 by the city’s authorities in the presence of the leaders of China and Kazakhstan, companies from Kazakhstan are now using Lianyungang’s port facilities. While Lianyungang used to be recommended as a laid-back town of a kind in which one could spend their elderly years (if you don’t mind the nuclear reactors), the city has recently seen an uptick of economic activities. The port was recently expanded and the already described new business district is being built northeast of the city and northwest of the port, on a small island which is actually so close and well-bridged that it forms an easy addition to the coast. The cost of land for investment is very competitive in comparison to other cities. Led by its mayor, Lianyungang embarked on a regional-level diplomacy mission that is common for many of China’s provinces and cities. Apart from the already mentioned deal with Kazakhstan, Lianyungang’s international cooperation now includes, among others, an agreement signed with the Belarusian city Zhlobin. Lianyungang seems now ready to both reclaim the land from the sea and lay a claim to a sea of opportunities inland. Yet, obstacles and doubts remain. Lianyungang is not even the capital of its province, Jiangsu. It is a prefecture-level city and there are bigger and economically more important cities even in the province, not to speak of a broader region. 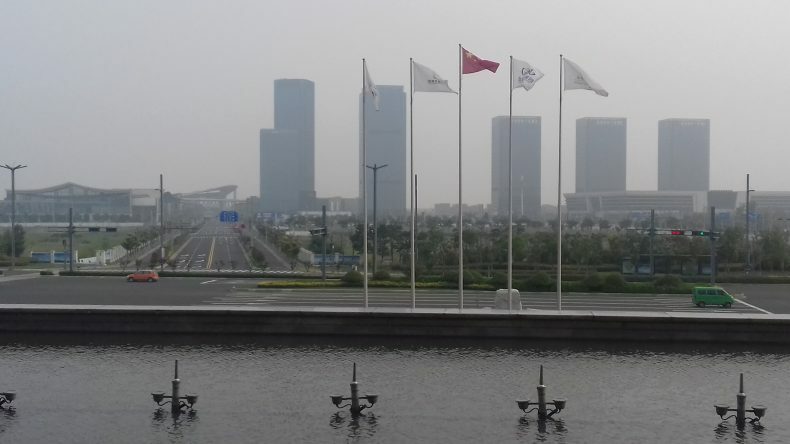 Lianyungang is also obviously not the only Chinese city which is both a port and a trading center connected by rail to Central Asia. While trade can expand, at least one of its sources – the Eurasian railway connection – is, after all, limited in its capacity and the establishment of new railway connections seems hardly a viable option. Yet, among other and more concrete advantages that Lianyungang has it now gained a new one – the OBOR/BRI logo on its team’s T-shirts. The OBOR/BRI project is visibly offering a wider advertising platform for some of China’s lesser known regions and cities. It is not that without this initiative economic opportunities and regional-level diplomacy would not be possible. It is not that without this project investment would not come and new infrastructure would not be established. It is just that cities like Lianyungang can get the hold of the OBOR/BRI promotional balloon to claim that their efforts are a part of a wider, national strategy. Both Chinese and foreign institutions have understood that using the OBOR/BRI symbolism may provide additional popularity to a project or an event. Lianyungang understands that very well too. The city’s marketing materials use the “One Belt, One Road”/”Belt and Road Initiative” catchphrase. Just few weeks after Xi’s mention of Lianyungang in Beijing, a conference on the One Belt, One Road was held in the city (which is how I ended up in Lianyungang). 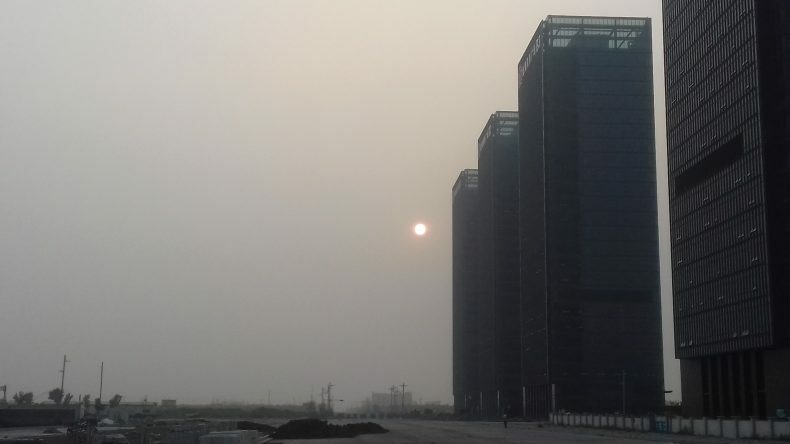 As I was walking back from my short tour of the under-construction business district the sun was getting ready to sink behind row of tall and empty office buildings. A bus went by, manned by a woman driver but otherwise empty (the previous bus had some 3 or 4 passengers in it). One may think here of Wade Shepard’s book, The Ghost Cities of China. Yet, Lianyun New City is different. Shepard’s “ghost cities” told the story of residential areas waiting for a flood of people moving from rural to urban areas. 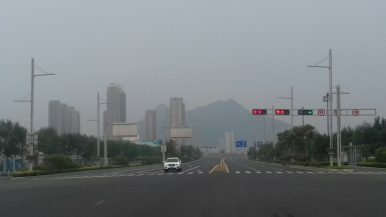 Lianyun New City, in turn, is a new business district waiting for more investors. But the two do have something in common: very meticulous Chinese pre-planning. Some would say that it is too risky to plan and build so much before an expected process actually starts. Others, however, would point out that the only preparation is a good one. Building an empty district before the economic activities will start is an obvious risk of overshooting one’s capabilities. But, as many examples around the world show, reacting when the process has already started can bring about haphazard systems and inefficient improvisation. After all, Lianyun New City is a city waiting to be born – and when you wait for the birth, you prepare the house beforehand (despite the risks of pregnancy) rather than wait until after the delivery. The movie is also a promotional feature for One Belt, One Road.